George Dallas’s career in Scottish athletics has been summarised elsewhere on this website but it is not generally recognised how good an athlete he was before he became an official. A top grade official, recognised as a more than efficient administrator, an excellent reporter on matters to do with the sport first of all for the Daily Record under the pen-name of Ggroe and then for the ‘Glasgow Herald’, George had been a Scottish champion and an international runner before any of that. His running career, as for so many of his generation can be split into before and after the 1914-18 War. Joining Maryhill Harriers in 1906, George first started to appear in results columns in 1908 and on 9th May 1909 in the Clydesdale Harriers Sports at Ibrox he won the half mile running from a mark of 35 yards in 2:01.4. The races were almost all handicap races and winning a handicap meant that you were given a less favourable mark next time out. That and the sheer numbers competing meant that the sprinters often had two round of heats before the final. Making the first three was not easy. George’s next notable prize was on 17th July 1909 at the highly rated Ayr FC Sports where he was second in the half mile won by Rodger of Paisley in 1:59.8 off 30 yards. Dallas ran cross-country races, as indeed did almost all middle distance track me, the difference was that at this point Dallas was running the 440/880 yards races with the occasional outing over 220 yards. In his book ‘Whatever the Weather’ Colin Shields says: “In 1910 Dallas won Maryhill Harriers 9 mile club championship, bettering the course record by 2 minutes with three other clubmates inside the old record. This run established him as favourite for the Western District Junior title and he justified this position by winning the 7 miles race in 41 minutes 05 seconds. In a close finish he was three seconds clear of A Austin (Greenock Glenpark Harriers) with D Peat (Motherwell YMCA) third, one second behind. 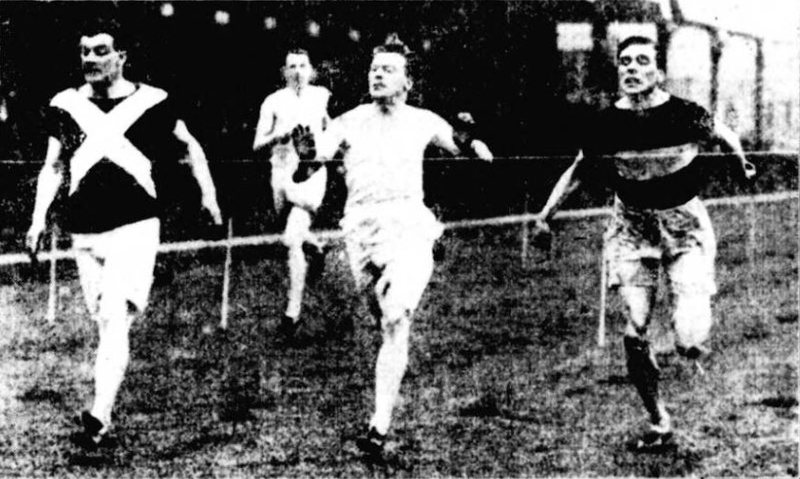 Dallas led Maryhill to their first ever team victory in the championship.” The Glasgow Herald described the race, in which there were 21 teams of 12 men, thus: “on entering the home straight, Dallas of Maryhill Harriers was to the fore but he was closely followed by Aitken of Greenock, with Peat of Motherwell behind him. The finish was exciting and the leader, with a final dash, won by a couple of yards.” Dallas’s time was 41 minutes 05.8 and his club won the team race from Glenpark Harriers and Garscube Harriers were third. Came the National, and Dallas was unplaced but was nevertheless finished far enough up the field to be picked for the Scottish team in the international to be held at Belfast on 26th March. He was unfortunately unable to run in the race itself and the chance was not to arise again. It was now on to the track season of 1910. Having won his first cross-country championship medal George, on 25th June, 1910, in the SAAA Championships at Powderhall was third in the 440 yards to G Anderson who was timed at 53 seconds. A week later, on 2nd July at the Beith FC Sports he won the first heat of the invitation 220 yards, off 8 yards, in 23.2. In the Final he led all the way to win in 23.4. The biggest meeting of the summer other than the SAAA Championships was the Rangers Sports at the start of August (6th) and he ran in the invitation 440 yards from a mark of 13 yards. He won the third heat and went in to the final where Burton was a clear winner being 3 yards ahead of Dallas and Hepburn of the West of Scotland Harriers who almost dead heated for second. A week later and on 13th August at Celtic Sports he was unplaced in invitation 220 yards. Despite his specialising in the 440 yards with races at 220 also on his programme, he continued to run cross-country, and in the National Cross-Country Championships on 4th March, 1911 there was no team entered from Maryhill Harriers but Dallas ran as an individual. Well up early on he fell away and was unplaced at the finish. But the track was where he did most of his running. Known later in his career as a good first leg runner in the medley relay, Dallas went up a distance from 440 yards to 880 at the Clydesdale Harriers Sports at Ibrox on 27th May, 1911, and won his heat 2:01.4 by three yards from a handicap of 8 yards. He was however unplaced in the final which was won by A McPhee of Clydesdale Harriers from a mark of 12 yards in 1:59.8. On 10th June, Bellahouston Harriers held their sports, as an experiment, at the ‘picturesque’ ground of Pollok Football Club. The ground turned out to be not really suitable for an athletics meeting but George Dallas turned out in the half-mile off a mark of 8 yards. Second in the second heat, he was again unplaced in the final. Next up was the Beith Football Club Sports on 1st July where he again ran in the half-mile. The Glasgow Herald remarked that “George Dallas (Maryhill) registered his first win for the season in the half-mile handicap, in which he ran with something like his old fire. He finished in great style, beating RF Gilbert (West of Scotland) when the latter looked an easy winner.” Dallas was running off 12 yards and won by three yards from Gilbert who had a mark of 130 yards. In the report on the Ayr FC Sports on 15th July, the reporter remarked that George Dallas seems more at home on grass than on cinder tracks; at all events, his recent successes would seem to support this conclusion. He won the event, running from 10 yards this time, in 2:01 from Edward Miller of Newcastle (50 yards) and WR Holman (Clydesdale Harriers – 48 yards). There were 35 starters out of 40 entries for this race but at the start of the second lap there were only ten still running! At this point Dallas was well behind but running well within himself and at the last bend put on ‘a brilliant spurt’ and beat Miller by inches. This meeting was held on the same day as the Scoto-Irish international where Scotland had first and second places in the half-mile thanks to Burton and Soutter. At the Rangers Sports, Dallas had a mark in the Invitation 880 yards of 18 yards It was a very high quality race with the American HE Gissing (a sub 1:57 runner), Soutter and DF McNicol all in the line up but Dallas did not run on the day. Dallas did run in the Monday supplementary meeting of the Rangers FC Sports where he won the 300 yards off 10 yards from Christie (West of Scotland – 6 yards) in 32.2 seconds. On August 14th at the Celtic Sports, Dallas ran in the open half mile – it had been expected that Gissing would run but he was not on the starting line and Dallas was third (off 25 yards) behind Stoddart (West of Scotland 55 yards) and Campbell (Garscube 65 yards). Gissing ran in and won the invitation half-mile in 1:58 from DF McNicol of Polytechnic Harriers. With the football season starting on 21st August, there was no Monday supplementary meeting at Celtic Sports. Dallas had a quiet year in 1912 but on 3rd August he turned out in the invitation half-mile at the Rangers Sports which featured Meredith, Sheppard of the USA and Braun of Germany and qualified for the half mile from a mark of 40 yards. In the Final none of the three Olympians mentioned ran anywhere near their form, with the race going to McGuire of Glenpark Harriers with Sheppard finishing third in 1:58.2 against the race winner’ 1:53.8. A week later at the Celtic Sports the invitation 880 yards was won by the three Olympians in a disappointing race but Dallas was off virtual scratch in the open handicap race and qualified for the final. The first three were running from 62, 67 and 70 yards in a large field and neither Dallas nor Sam S Watt of Clydesdale Harriers managing to work their way through the field. On 31st May at the Clydesdale Harriers Sports Dallas ran well in the heat of the half-mile and according to the reports he ran with great judgement. In the Final however he left it too late to figure among the prize winners with the race going to Carmichael of Garscube who was running from 52 yards. The papers looked forward to the Hawick Common Riding meeting the following week end and particularly the mile medley relay for the Wyoming Cup. Relays were quite popular at the time although Maryhill very seldom turned out a team in any of them. The Wyoming Cup had been donated to the Hawick meeting by a group of ex-pats living in Wyoming and the rules stipulated that any club winning the trophy three times would be entitled to keep the trophy thereafter. In 1913 the race had been won twice by West of Scotland and twice by the local Hawick club, Teviotdale Harriers. If either won this time round, they could keep the valuable cup. On the day, the first Saturday in June, West of Scotland won with a team of JH Rodger, RC Duncan, HJ Christie and George Dallas. They claimed the cup. Teviotdale felt very hard done by. Dallas had never run for West before this, he was known as a Maryhill Harriers of great ability and the feeling of disappointment lasted for over a century. Nevertheless the Glasgow club reported in their annual handbook: “‘The club has competed this season in several Relay Races. At Hawick we won the Wyoming Challenge Cup for the third time, and this now becomes our absolute property.” What happened next to the trophy? West took it home to Glasgow and put it up for competition at some of their meetings. There is no note of him running in the SAAA Championships on 28th June but he was named as reserve to DF McNicol and R Erskine for the international against Ireland on 19th July. Before that however he competed at the Maryhill Harriers Sports on the eighth of the month at Ibrox. He ran in the half-mile from a mark of 10 yards and was third in his heat behind Adam Veitch of Garscube (45 yards) and Sans Unkles of West of Scotland (25 yards). In the final he was unplaced with first place going to A Smith of Falkirk Victoria Harriers who had an allowance of 35 yards. Pollok Football Club held a Sports meeting on 12th July at Haggs Park and Dallas was third in the half mile there behind Smith of FVH and SS Watt of Clydesdale Harriers. In the International in Belfast, Ireland on 19th, he ran in the 800y and was first Scot to finish when he was second. As we have seen, relays were popular events and at the Rangers Sports on the first Saturday in August, a Glasgow Select faced off against Polytechnic Harriers from London. The Southerners won ‘by a small margin’ in 3:33.4 with Dallas running on the first (880 yards) stage for the Select. He ran another relay for a Glasgow Select against Polytechnic Harriers and Salford Harriers – this time he ran the last (440 yards) stage for the Glasgow team that was third. His main event however was the 500 yards invitation in which Nicol of the Poly Harriers was trying to beat the British record. He didn’t quite make it but Dallas, running from 18 yards, won by a yard in 58.4. The Glasgow Herald described the time as a second and a half outside the British record. On 16th May, 1914 George Dallas was a member of a relay team that defeated an English club team – but the team he was running for was West of Scotland and the English team was Broughton Harriers. It was held at the joint Celtic and West of Scotland Harriers Sports at Parkhead with, in running order, Duncan McPhee (who was still a member of Clydesdale Harriers) on the first stage, G Hamilton (a Maryhill Harrier running as a second claim West man), HJ Christie and Dallas (who was still a Maryhill Harrier) on the final quarter mile. Winning time was 3:43.8 and the winning distance ten yards. Meanwhile Greenock Morton FC held their sports at Cappielow Park on 23rd May and Dallas ran in the half mile from a mark of 14 yards and won his heat but was unplaced in the final which was won by HD Soutter of Greenock Glenpark off 35 yards in 2:04.4 from JM Lindsay (Edinburgh Harriers) off 40 yards. On 30th May at Ibrox in the Clydesdale Harriers Sports Dallas (14 yards) and McPhee (scratch) both contested the half-mile. Interestingly Dallas was listed as Maryhill and West of Scotland Harriers, and McPhee was listed as Clydesdale and West of Scotland Harriers! Dallas won the first heat, McPhee was second in the second heat with three to qualify, and in the final Dallas won by five yards in 1:59.2. On 6th June, the famous West of Scotland team travelled to Hawick for the Mile Relay and the team of Dallas, Hamilton, Christie, McPhee (listed in the order which might well have been the reverse running order). The SAAA Championships were held on 27th June at Powderhall and the half mile was won by McPhee (West of Scotland in the programme) from Ralph Erskine (Clydesdale Harriers) and George Dallas (Maryhill in the programme) in third place. The West of Scotland Relay team was in action once again on 25th July at the Greenock Glenpark Sports and they won again in 3:50.4 leading all the way after McPhee led the first half mile stage home. At the Monday supplementary meeting for the Rangers Sports on 3rd August, Dallas ran in the invitation 1000 yards from a mark of 32 yards. The American Homer Baker was also running and broke the Scottish record, set three years previously by American HE Gissing, for the distance by one fifth of a second with his time of 2:16.4. Less than a week later, the world was at war. Less than a year later – in July 1915 – T Barrie Erskine, the limit man in the 100 yards invitation race would be dead, killed in action at Hooge in Flanders.